Daily Bible reading is encouraged and group Bible studies are considered a critical element in our spiritual growth and journey. Studies are offered in the evenings or mornings and some Biblical based supplemental studies are read to enrich sermon series. Contact us for a list of current studies you are invited to join on Sunday mornings or other designated times during the week. Visit our Testimonies about Mt. Zion on YouTube and also other written Personal Testimonies of Faith. 2nd Saturdays each month except during the summer. ​The UMM are rather famous for their delicious church-cooked Peanuts for Missions plus their service around the church and support of fund raising events. A photo of their church cooked peanuts is displayed on the Missions page. Many of the men also serve on the Trustees maintaining our church building and grounds. 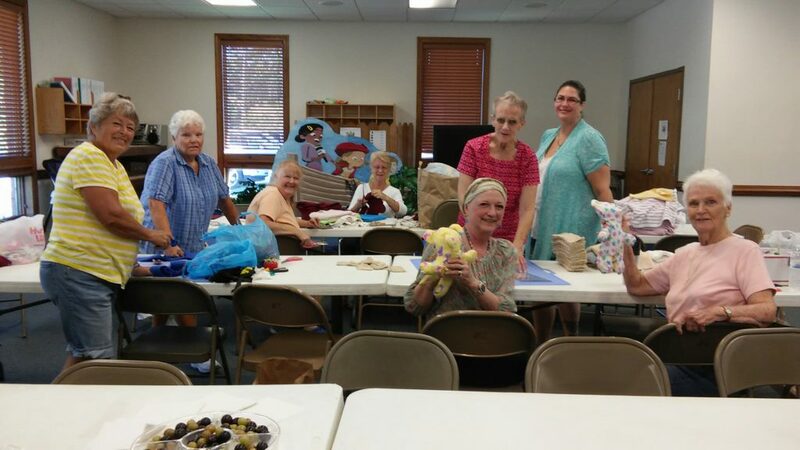 Joyful Hearts working on Teddy Care Bears for Christ Children's Ministry. The Joyful Hearts Ladies Bible Study group meets weekly on Monday mornings at church or off-site locations. They gather in the name of Christ to pray and grow together in the Word often covering Christian themed bible studies. Currently they are studying the Gospels in depth. New ladies are warmly welcomed. ​Their Joyful Desserts Recipe Books for Missions are available for only $5 per book! Donation proceeds go to support missions. Ladies are currently also working on special need items for the women and girls of Armenia as well as Teddy Carebears for children in crisis situations. Plan to join them! Classes meet 10:00 - 10:45 AM in the back section of the building. Newcomers are welcomed! their studies or references to lessons and pray together. Mrs. Dawn Pearce leads an Upper Room Devotional discussion themed class for adults. Ms. Doris Simon leads a bible study group that enjoys reading through the bible chapter by chapter. Our staffed nursery is open 10 AM to 12 Noon or until the completion of the Worship service. is led by Mr. Tommy Grandy and other helpers! They use the Deep Blue Bible Study scripture themes and crafts. Mrs. Lea Sliger leads Children's Church crafts along with class leader, Mr. Tommy Grandy. ​High School students called our Mt. Zion Youth Fellowship! Disciple Bible studies are also highly recommended for spiritual growth and discernment. They are in-depth group studies that cover the bible and can be life changing in your discipleship journey. Click on the Cokesbury Disciple link to learn more about the program.